As February is coming to a close, so are the layers and bulk we've all been wearing during the past few months. I'm ready to say "ovua" to the Winter season, with excitement for delightful afternoons. With each season, I like to re-organize my closet, tucking away jackets, vests, and sweaters, to make room for a new and freshened up look. In most cases, I'm usually left with a bare closet and basics, which I much prefer. It gives me the freedom to create a palette of new colors, patterns, and silhouettes that are fitting for warmer days. Subdued colors and romantic details have taken my interest, which may be of no surprise, if you know me well. My wardrobe is starting to feel pretty and feminine once again ... a bit of sophisticated elegance. Although I have transitioned to more of a casual gal these days, there's some excitement knowing that my everyday looks are detailed in beauty. Madewell is a place I often go to for classic pieces and high quality basics. 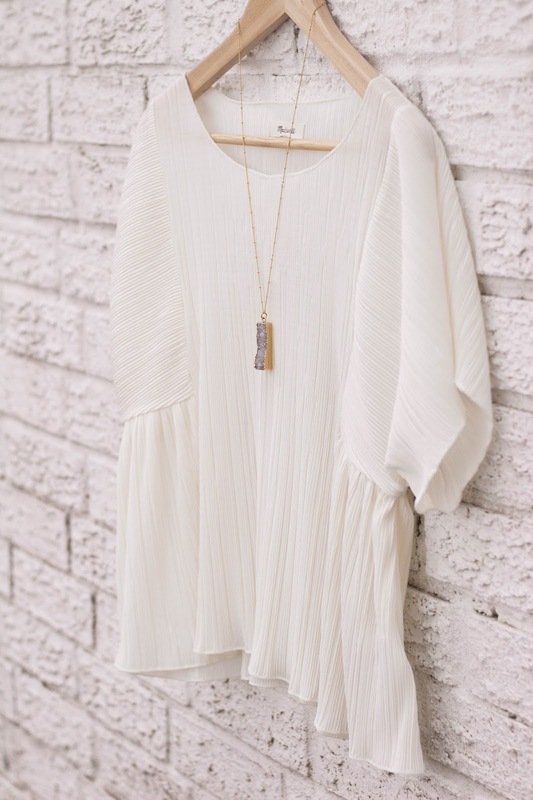 Highlighted in the store recently, I noticed how simplistic, yet elegant this top was. 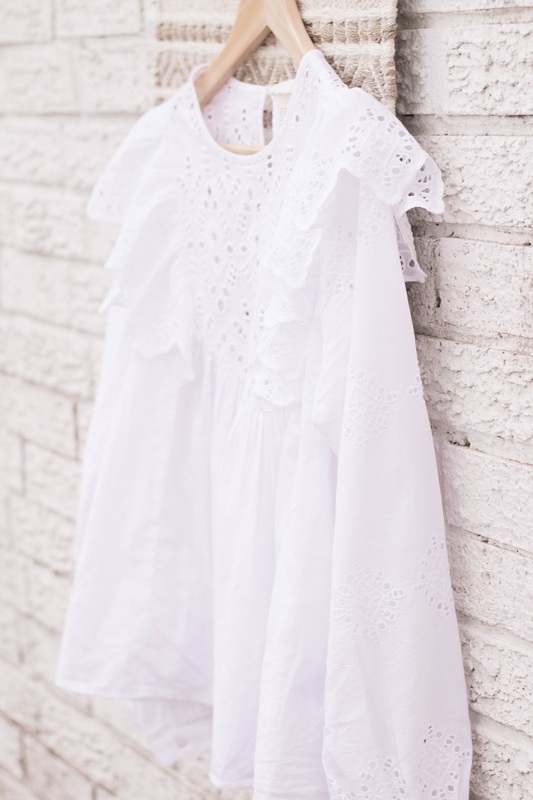 The mini pleating detail throughout gives you the option to dress it up or down and the fabric is so soft and light on your skin. I paired it with a jean skirt, which I think we'll be seeing more of this Spring. Jean Skirts are fun + flirty (a bit more forgiving than jeans) and you'll find many at knee length and below this season, for a well put together look. 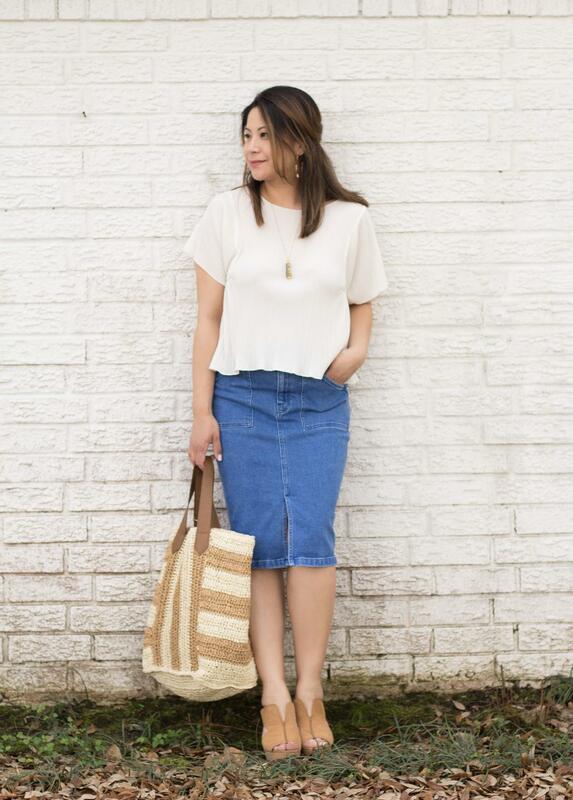 This Madewell top is available in many colors, so pick up a couple in your favorite shades! You'll be glad to see how well this new Spring basic compliments your current wardrobe. 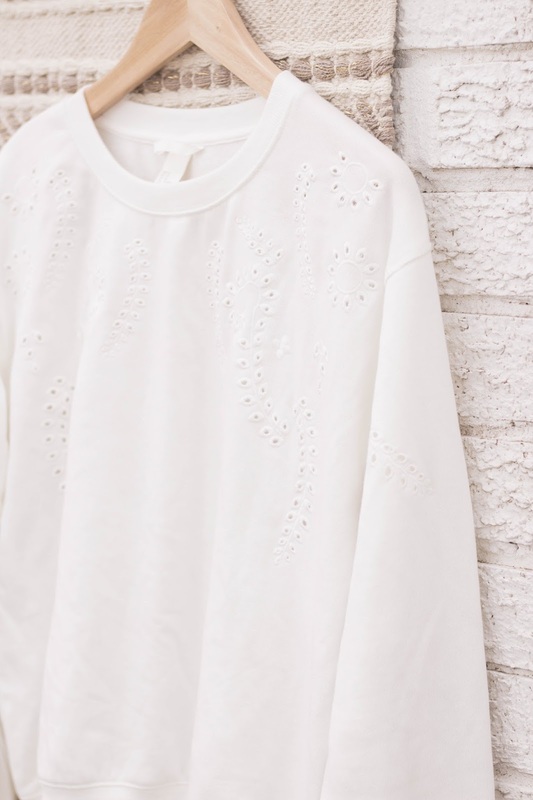 Nothing screams more pretty + feminine, than an eyelet print and ruffled details. 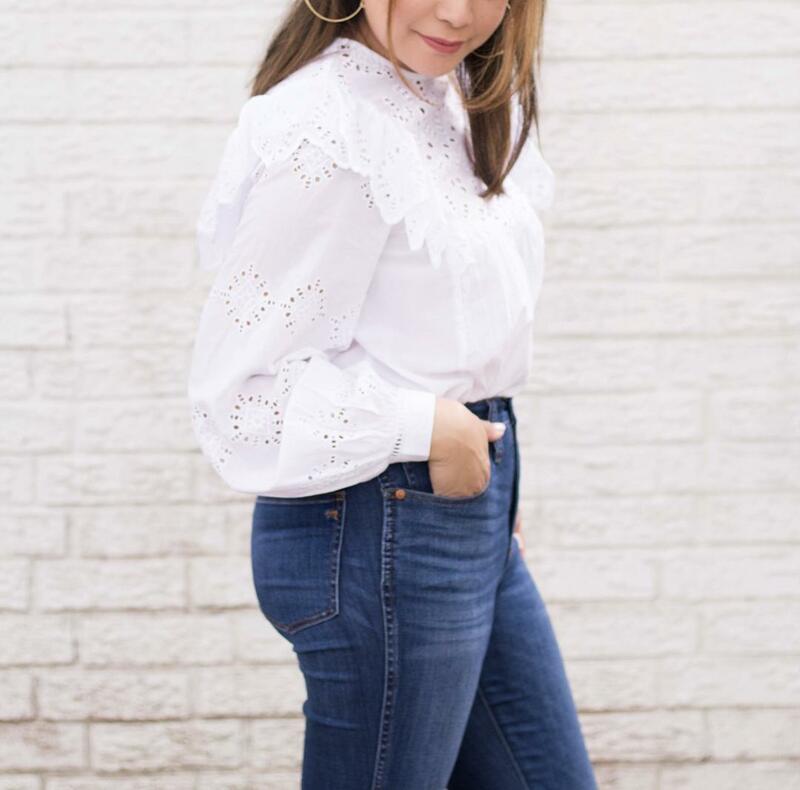 Eyelet prints usually pop up every Spring season in new and re-invented ways and I love that I see more of this cut-out design in tops, mixed with other girly details. 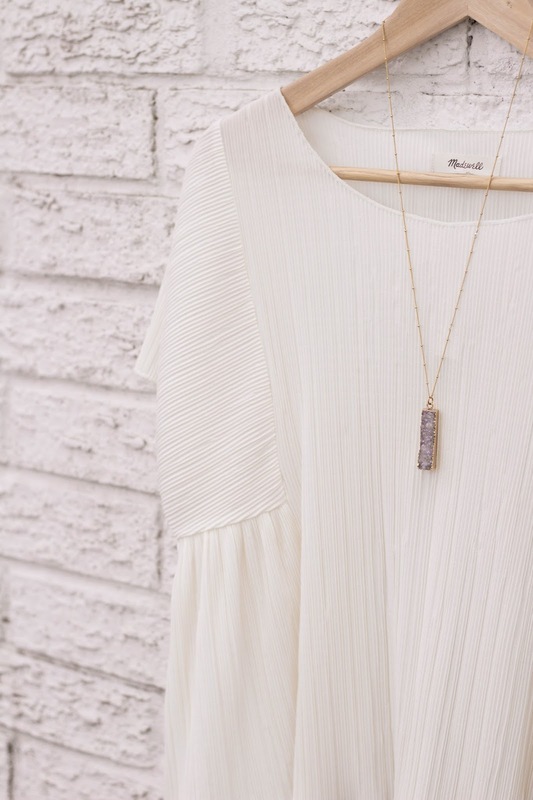 Paired with pretty ruffles and flowy silhouettes, they are a match made in heaven. Both of these tops from H&M have become well loved and they work perfectly with a casual pair of jeans or a slim pencil skirt. Try an eyelet print or ruffled top with patterned bottoms: from stripes to floral prints, they work fantastically with both! All Winter long, I was wearing a load of black and grey with occasional warm tones. Once February hit, I was ready to move on to romantic and subdued colors, that would really soften my look and add some elegance to what I was wearing. Blush is one of my favorite colors to decorate with, which is almost always incorporated (in some regard), into the spaces I decorate. But I soon found myself picking up more transitional pieces in this shade. My complexion looks so soft when I wear this color and I feel romantic, even with more casual looks. This is a color that brings about confidence, elegance, and beauty ... and who doesn't want that! 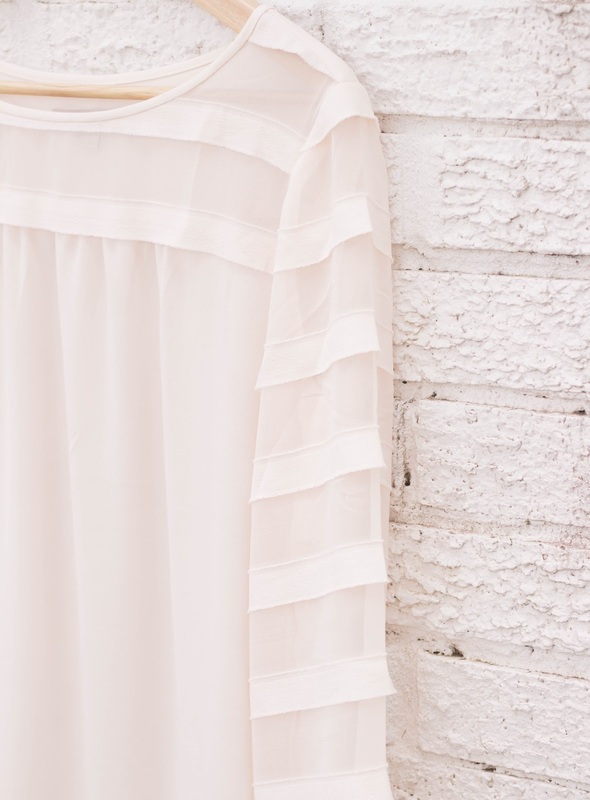 Blush works just like a neutral, so make it a great alternative to your white and beige tops. This Spring, I committed to wearing larger and bolder earrings! Hoops really, with a boho vibe to them. I wanted to highlight my new mid-length haircut and hoops did it for me! Playing with my hair a lot now-a-days, these hoops seem to highlight any hairstyle I choose that day. Whether it's wearing my hair parted in the middle or with an exaggerated side part, these pretties go with anything and everything. Go with larger hoops, as they'll give you a lengthened look, which I can really appreciate it! For an amped up take on your classic sneakers, choose a shoe with simple details that pack a punch. 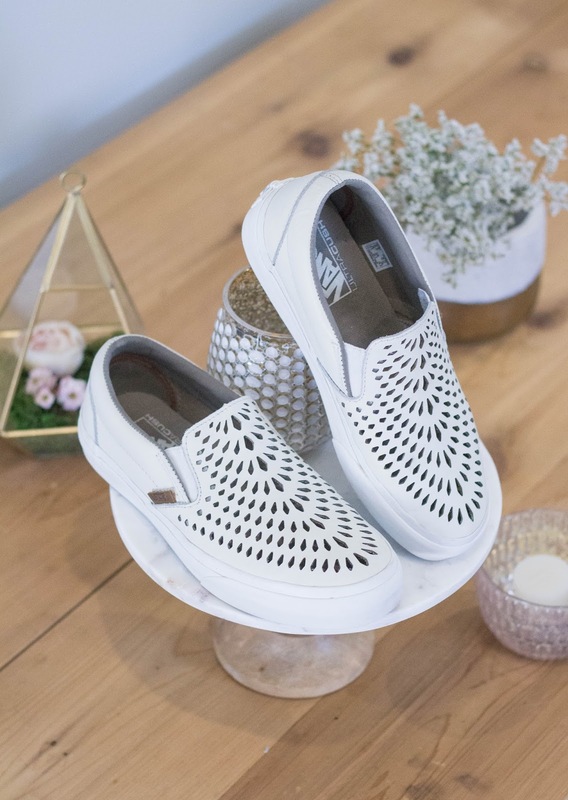 I love wearing my Van's SQ-8 cut-out slip-on's, which are my current go-to's for all my casual days. These sneaks add a little more to my outfits and I adore them so much that I'm tempted to buy a second pair to have on hand, when these gets old. They're currently available in store at Nordstrack Rack, but a few others are linked below with a similar pattern. 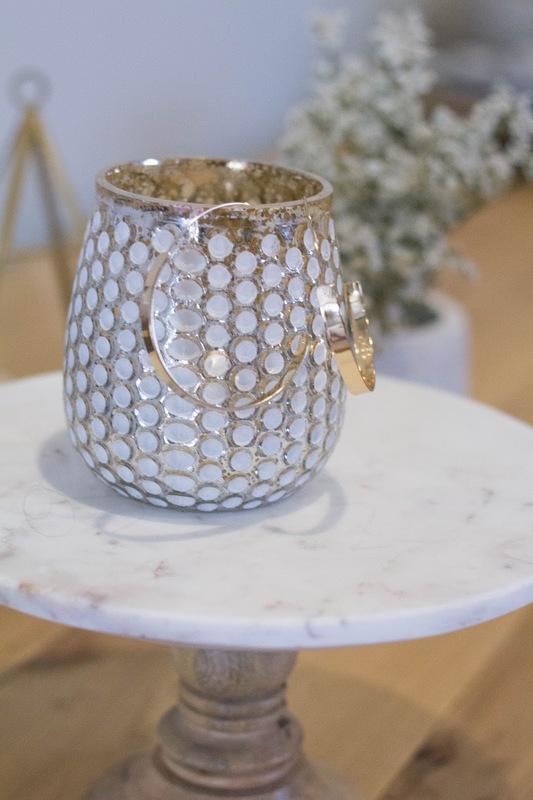 Sophisticated details in casual wear has added much personality to my wardrobe, while making me feel confident and beautiful on the day to day. What is your favorite Spring detail? Be sure to see all my picks below for the looks shown and for similar options. Have a wonderful day friends! Welcome to February friends! 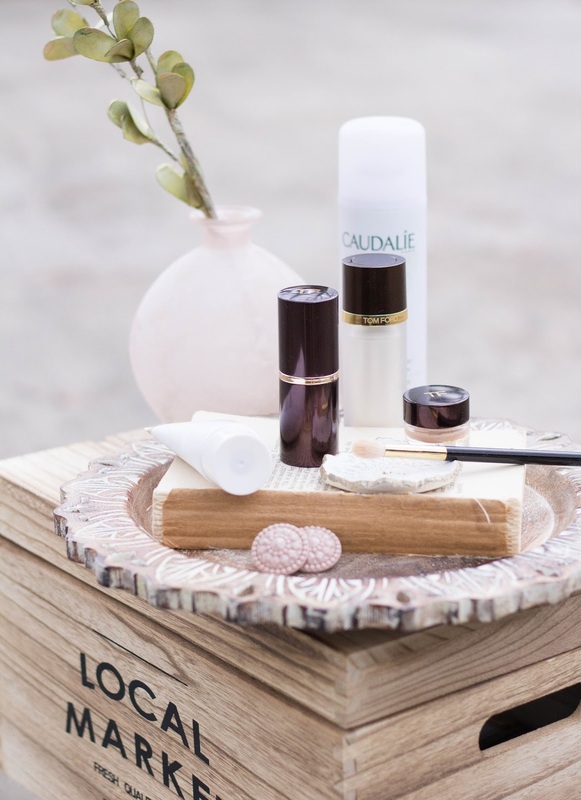 The cold winter temperatures continue to make their way through the new year and you might find that your complexion is feeling drier than usual. Between staying in cozy heated spaces to going outside in the dry cold weather and back again, your skin is probably taking a toll from the lack of moisture in the air. That sure was the case with me in December, especially since I was also getting over a cold. A couple of months ago, my skin was feeling fairly tight and dry patches starting to peak through. I wasn't drinking a healthy amount of water each day and I knew I had to make some changes to my lifestyle, if I wanted to have great skin again. So, I amped up my water intake to 4 water bottles a day and changed my skincare and makeup routine to address my need for hydration. After incorporating a few good for your skin products, I was able to rejuvenate and freshen up my complexion, making it look it's best this Winter season. I'm so happy to report that my skin looks smooth, supple & radiant, and I owe it all to a new regime that I can't wait to share with you! 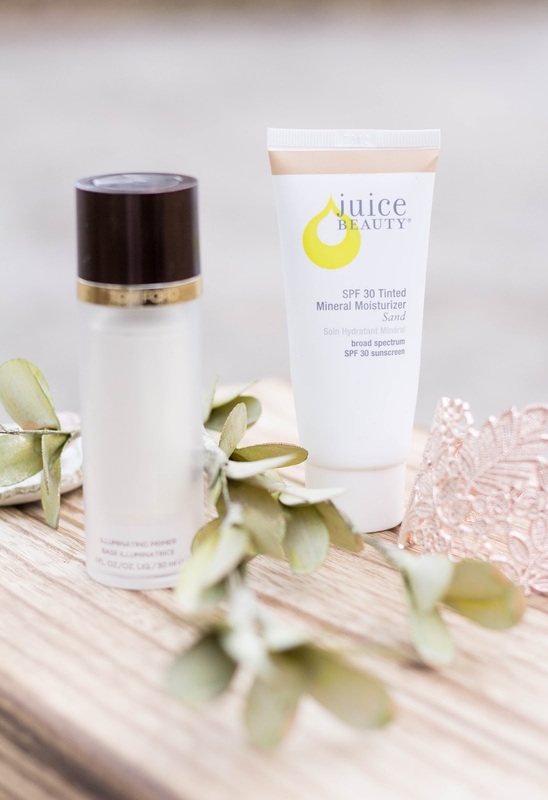 Below are products I've added to my daily skincare & makeup routine that have promoted healthy, plump, and youthful looking skin ~ all perfect for sensitive skin. I'm also sharing application tips that truly helped me to get my complexion to the best it's looked within the last year. 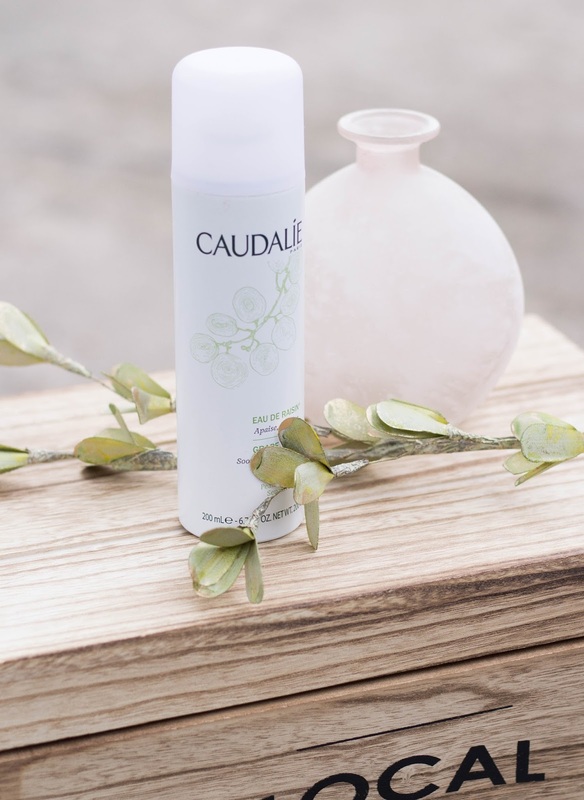 The first step to my morning and nightly skincare routine starts with a generous spray of the Caudalie Grape Water Mist for a pleasant boost of hydration to my face and neck. It's an organic hydrating mist that infuses moisture back into your skin and it also calms any redness you may be experiencing from the dry and cold conditions. In combination with my Foreo facial brush that I use for cleansing and as a light exfoliate for my face, I feel this mist has helped my skincare soak in much more effectively. It's perfect for sensitive skin and it's a product I can't live without! A helpful tip: Gently exfoliate your skin at least once a week to keep your complexion clear and texture free. If you're using serums and other skincare products to resolve any skin concerns, a light exfoliation or peel helps to reveal a polished and rejuvenated complexion that rids out all the "gunk" that was brought up to the surface. This simple, yet effective step will tremendously improve the way makeup applies and looks on your face. During the winter months, layering moisture to dehydrated skin is key. 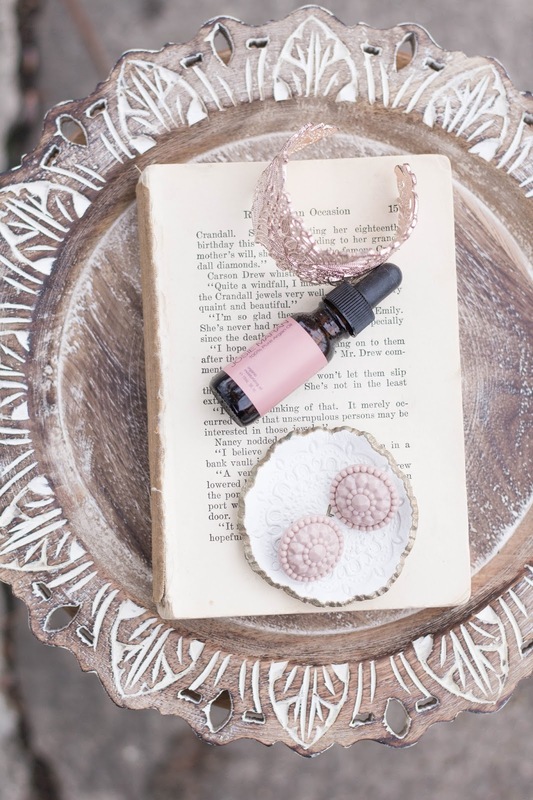 I love incorporating beauty oils into my skincare routine, in particular this Argan Oil by Josie Maran. This oil acts as a lightweight boost of moisture, alongside my daily moisturizer. With a powerhouse of Vitamin E, it fights against wrinkles and fine lines, promoting youthful skin. It is very lightweight and helps with a smooth makeup application. I apply roughly 4 drops onto the palms of my hands and press it onto my face and neck. Dab a small amount to the under eye area before applying concealer, for a flawless under eye concealer application. 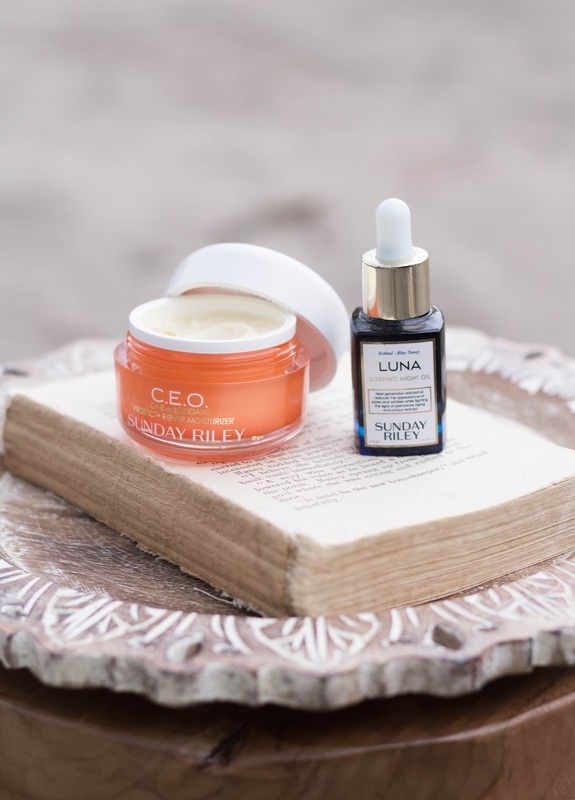 The two night time skincare products that have practically been a god send for my skin have been Sunday Riley's Luna Sleeping Night Oil and the C.E.O. Protect + Repair Moisturizer. They both have had different benefits on my skin and have kept my complexion clear, smooth, and especially radiant. 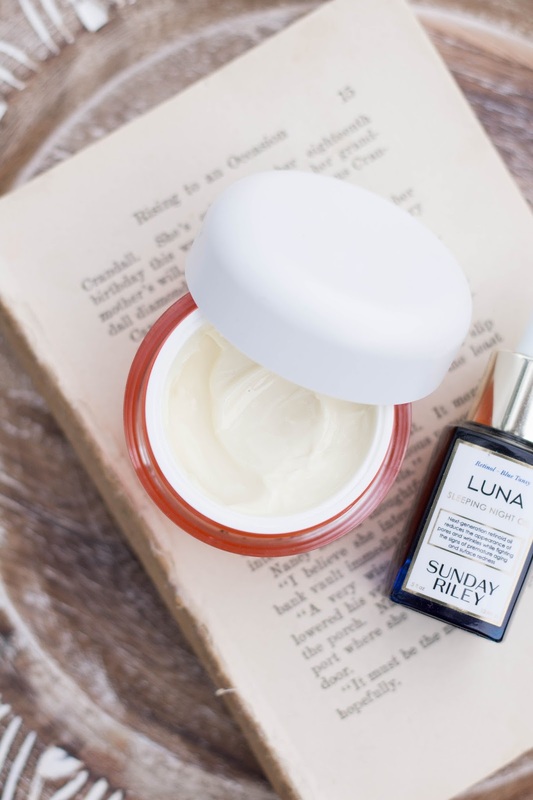 I press a few drops of the Luna oil onto my skin before my moisturizer that keeps my skin smooth and even-toned. The C.E.O. moisturizer aids with adding hydration throughout the night, while giving my skin a beautiful glow. It feels rich and absolutely divine, sinking right into the skin within a few minutes. This is one AMAZING night time moisturizer! Helpful Tip: Instead of swiping your skincare onto your face, gently press each product into the skin to allow all the goodness to properly soak in. I also like to wait 3-5 minutes to let each product thoroughly absorb into the skin before applying the next skincare product. I strongly believe I have gotten the best results from my skincare using this method. These are other hydrating moisturizers that I highly recommend and have worked amazingly for my sensitive dry skin: Lala Retro Whipped Cream Moisturizer by Drunk Elephant, and First Aid Beauty's Ultra Repair Cream. With as much as we spend on foundation, we can have this expectation that our foundation should perform the same all year through. 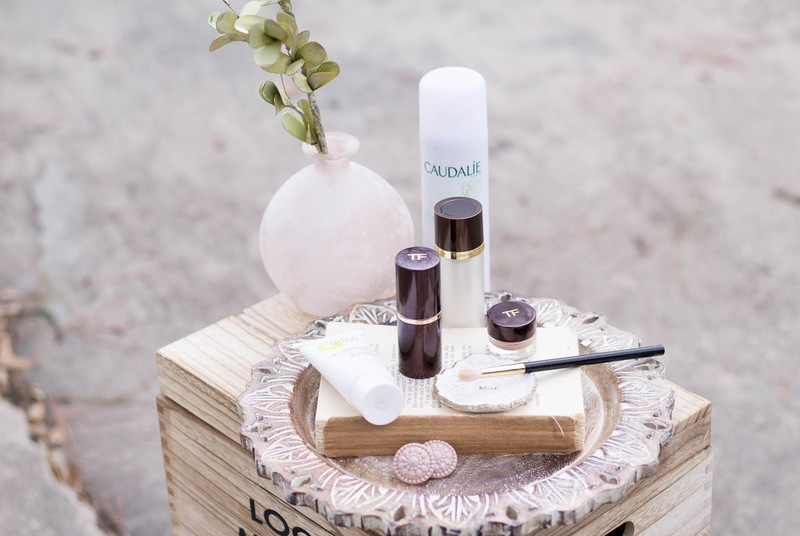 However, without the proper hydrating steps, your foundation can start to cling onto dry patches and settle into lines and wrinkles that you never knew existed. 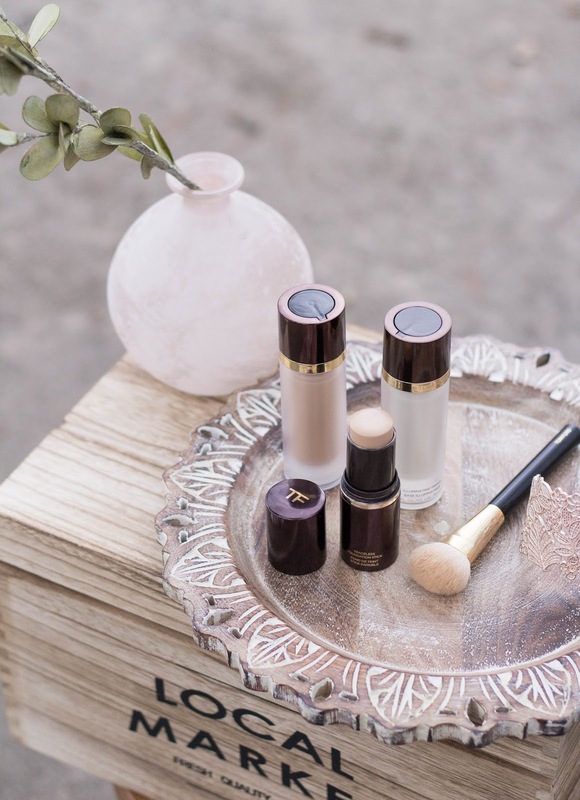 Adding radiant primers and/or bases before foundation helps to create a flawless makeup look that leaves you with a beautiful glow from within. 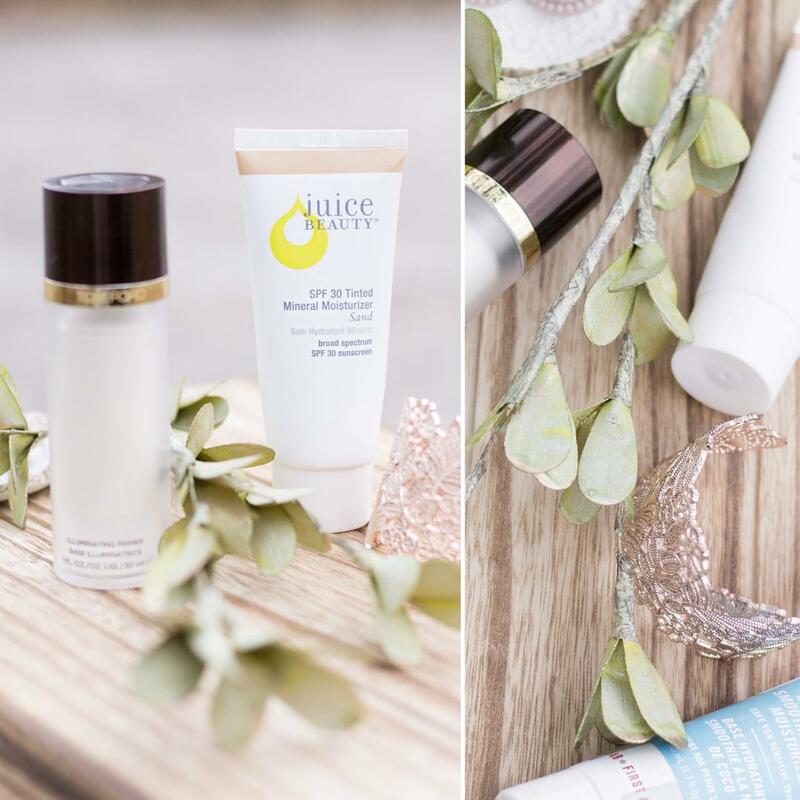 I've raved about this tinted moisturizer by Juice Beauty before and I really can't go a day without it! With SPF 30, this tinted base adds the right amount of luminosity to my complexion and acts as an excellent primer before foundation. 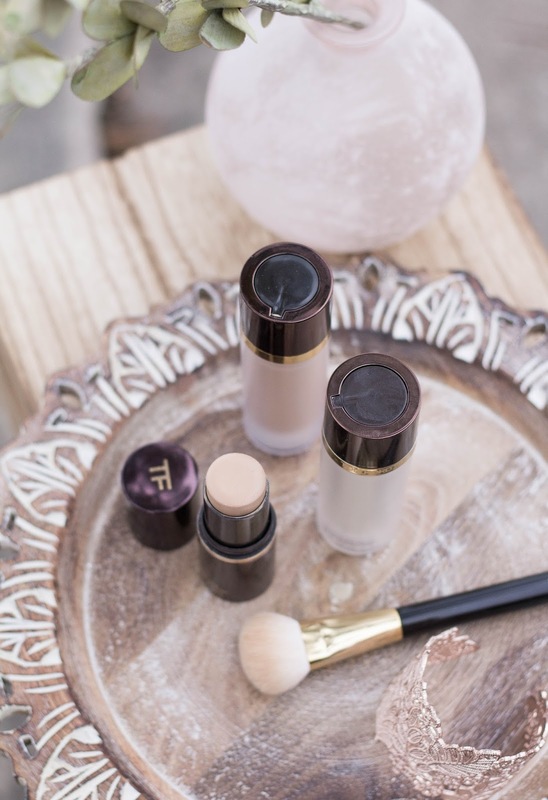 It evens out my skin tone for those "no make-up" makeup days and works perfectly with my everyday cream stick foundation, Tom Ford's Foundation Stick in Bisque. Other primers that I also love for added luminosity is the Coconut Skin Smoothie Priming Moisturizer by First Aid Beauty and the Illuminating Primer by Tom Ford. Both provide a gorgeous glow to your complexion, with the primer by First Aid Beauty being the newest addition to my collection. Simple and effortless has been my philosophy lately, and such, have gone back to cream eye shadows. 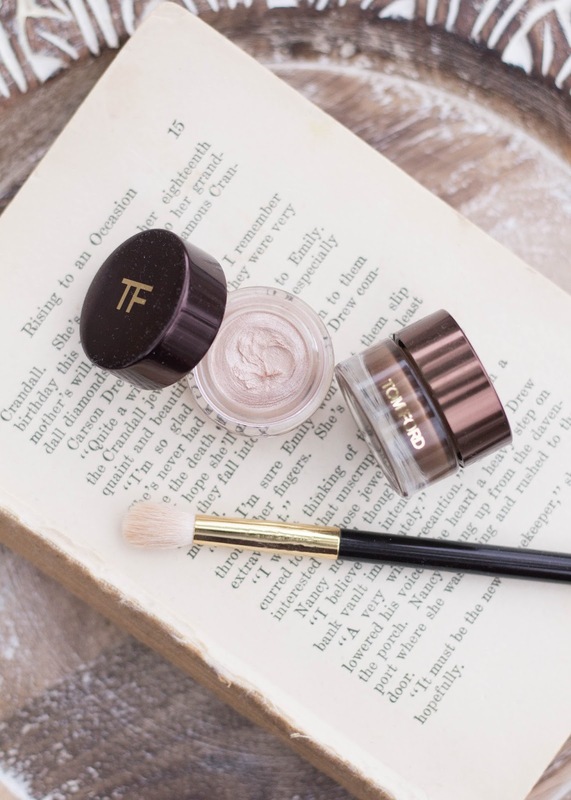 I love the easy blend-ability of the Tom Ford cream eye shadows and they apply effortlessly with fingers or a brush. I sweep Opale all over my eyelids and under the brow bone as a highlight, and layer Spice on top with a flat eyeshadow brush for precise application all over the lid. 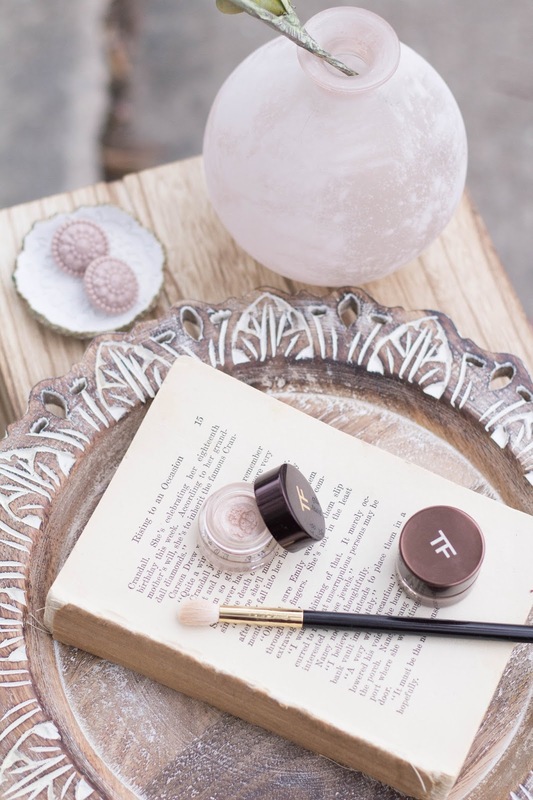 This combination adds an ethereal sparkle to my eyes that completes my everyday radiant look. Now that I've shared some of my favorites this Winter season, I'd love to hear about yours! What skincare or makeup products have you been loving this season?! Thanks so much for hanging out with me awhile and have a wonderful week!